I’ve been playing around with partitioning quite a lot recently and wanted to write a quick post about how it can help you out in a DR situation. Partitioning is mainly for increasing the manageability of your data but it also has other benefits, one of them being giving you the ability to split a single table across multiple filegroups. This will allow you to keep your current data in one filegroup and, let’s call it historical data, in another. In a DR situation, if you need to bring your current data online quickly and worry about the rest later, this can really help you out. 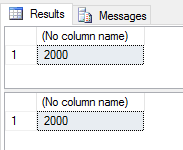 This database has three filgroups. The PRIMARY (as always), DATA and an ARCHIVE filegroup. What this demo is going to show you is how to bring the PRIMARY and DATA filegroups online first and then bring the ARCHIVE filegroup online afterwards. The table we’re going to build will be partitioned by year, two partitions on the ARCHIVE group and two on the DATA filegroup. So both filegroups have 2000 rows in them. Now let’s perform a filegroup restore, bringing the PRIMARY & DATA filegroups online first. Neat huh? You can see that in a DR situation, if you have a correct partitioning and filegroup strategy in place, you can reduce the amount of time it will take to bring your current data online. This entry was posted in Backup & Recovery, Partitioning. Bookmark the permalink.